I’m at an interesting point right now in my personal philosophy towards spending and saving. To give some background to my mental state, I guess I’d have to describe my personal finance upbringing. Essentially, there was none. I remember I was probably around 14 when my Dad sat down and discussed money and taxes with me. Before that, I guess my family had the old school mentality of “it isn’t proper to discuss money”. Fast forward to me graduating from college and getting my first job. I was seriously in awe with how much I was getting paid to basically solve little problems on the computer, and I enjoyed what I was doing. At the same time, my expenses were ridiculously low. I think I was paying $500/month for rent, with utilities included. Needless to say I saved some serious money. I really didn’t spend money on anything either, besides buying a new truck (which I still have today… paid off). Today, however, I’m add odds with how I feel about money. On one hand, I think I should save any extra money I come across, but on the other hand, I have a nice little nest egg. Should I spend money on material things that catch my eye and not feel guilty about it? 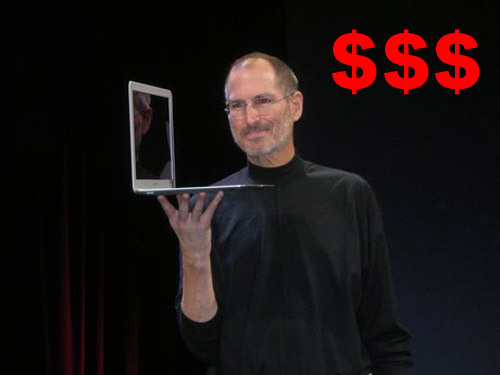 Tonight I’m probably going to go to the Apple store and drool over the new MacBook Air. If I felt like it, I could throw down some plastic and not think twice. I wouldn’t have to go into debt to get it, and I think it would be useful to have for blogging, working on websites, etc. But something inside me feels like I shouldn’t buy it… like I would feel guilty for indulging and spending that much money on something that I don’t “need”. Not to mention, I spent $550 there two weeks ago buying an iPad, which I still have mixed feeling about, but use pretty much every day. I guess I have a little guy on one shoulder telling me life is too short to worry about things like this. If there’s something shiny and new that I think would be cool to own, why not get it. On the other shoulder is a little guy telling me that I don’t need those types of things and I would be wasting my hard earned money. Guten Tag! Ich hätte schwören können, ich habe besuchten Diese Sekte weiterempfehlen vor, sondern nach Durchblättern eiin paar derr Beiträge Ich erkannte, es ist nneu fürmich. es, und ich werde sein bookmarking ees und die Kontrolle zurück häufig häufig! En caso contrario, hay que reclamar tal derecho. Gastos por no tesitura. Cantidad limitada.